Volume Discounts are extended based on yearly purchases from January 1 to December 31. Yearly purchases will be evaluated and adjusted on the date your purchases reach a new volume discount level. You will begin to receive volume discounts on the order which brings you to a new discount level. Once you reach $500 in yearly purchases you will begin to receive a volume discount of 5%. Discounts apply on most catalogue purchases. Volume Discounts do not apply on any item marked "no volume discount" or "non-discountable". The discount level you are at on December 31 will be carried over to the next calendar year and will be increased when you reach a yearly discount level greater than you are currently at. 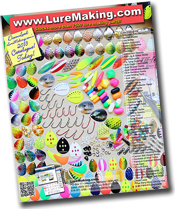 Please note discounts are not applicable on items marked "non-discountable" or "no volume discount" such as our Commercial Tackle Maker and purchases made at shows or seminars.